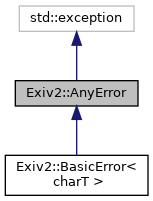 Error class interface. Allows the definition and use of a hierarchy of error classes which can all be handled in one catch block. Inherits from the standard exception base-class, to make life easier for library users (they have the option of catching most things via std::exception). addmoddel.cpp, exifcomment.cpp, iptceasy.cpp, iptcprint.cpp, and xmpsample.cpp.